Every time the stock market is in a precarious situation, there is one stock that becomes more important to watch in the financial sector than almost anything else, Goldman Sachs (NYSE:GS). This is because as a securities firm its business is more leveraged to the performance of stocks and the economy than any other stock. Technically, Goldman is a bank holding company reorganized in 2008 so it can get instantaneous lifelines from the Fed in times of need (the type of lifelines that were not forthcoming for Lehman Brothers at the time). In practice, it's more leveraged to capital markets than any other bank. Among its competitors, JPMorgan Chase (NYSE:JPM) is in many of the same businesses and is significantly more diversified, so it won't be as volatile. Goldman Sachs, for example, has very little direct-to-retail business and much bigger capital markets business relative to the total than JPM, while Morgan Stanley, the only similar firm on Wall Street that's publicly traded after 2008, has a large retail business. So what is the Goldman Sachs indicator saying now? The Goldman Sachs indicator relative to the S&P 500 SPDR is pointing down, which means that GS stock is weaker than the overall market. That happens when investors are not bullish on the business prospects of securities firms that depend on capital markets revenues. Still, companies like Goldman are enormously hard to forecast when it comes to earnings and sales, as they do proprietary trading, which may benefit from volatility. In other words, when revenues suffer in one part of the company, another part of the company can sometimes pick up the slack. Be that as it may, rising risk in the stock market typically means weaker GS stock relative to the S&P 500. That was certainly the case when the Fed began to hike rates in 2015, when the Chinese stock market crashed and re-crashed in January 2016. That instance of GS stock price weakness extended all the way into Brexit in mid-2016. Starting in April 2018, Goldman Sachs started a similar cycle of weakness relative to the broad stock market. 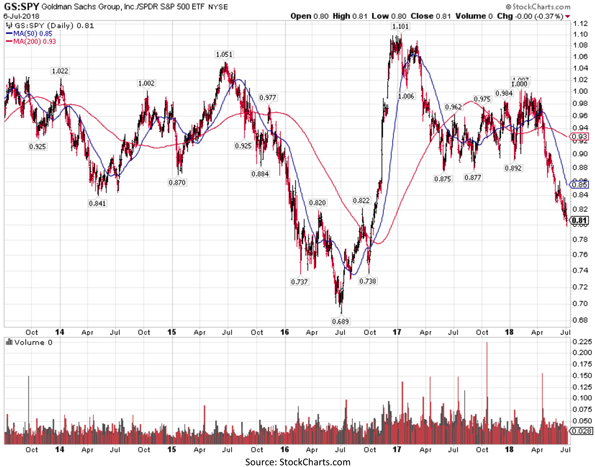 GS stock is also weak relative to the financial sector, which is telling. 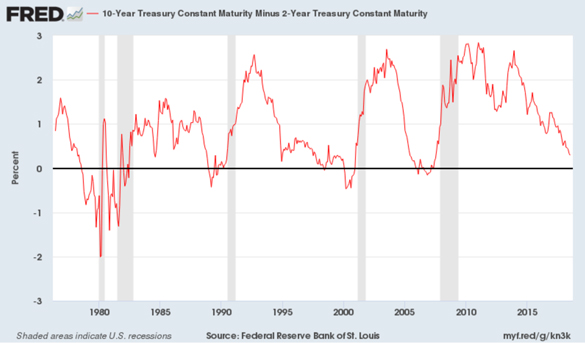 It should not be surprising that financials are weak as the 2-10 spread - one of the more popular measures of the slope of the Treasury yield curve (charted below) - closed at just 29 basis points on Friday. A flattening yield curve is negative for bank profits due to the tendency of banks to borrow short and lend long. That translates into shrinking net interest margins. Every bank is different as there are plenty of ways to earn fee income, but in general banks prefer to see the yield curve as steep as possible. It does not help that an inverted yield curve has preceded every one of the last five recessions. The last 10 times it has happened, nine have turned out to precede or accompany recessions. Investors see flattening or inverted yield curves as an indicator that the financial sector will have a tougher time producing profits. The same is valid for Goldman Sachs stock, as it has a more volatile P&L statement than the sector itself, hence the recent weakness relative to the financials. The last time we had similar issues with Goldman stock (from mid-2015 to mid-2016), it went on to make an all-time high. Could the same happen now? Not statistically speaking, if one considers the odds. 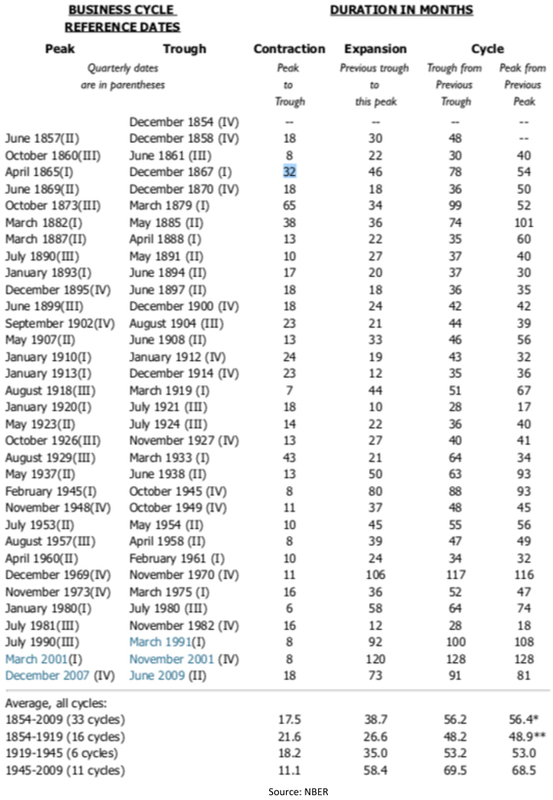 As this table shows, there have been 17 business cycles in the past 100 years (since 1919). The longest expansion in US history has been 10 years and the present one is nine years and one month long, so we are "long in the tooth." A real trade war - not just the threat of one, as we have now - can cut the business cycle short. A shorter business cycle would not be bullish for Goldman Sachs, nor for the financial sector. I thought it was worth the effort to check if the same dynamic was happening elsewhere in the world and decided to concentrate on Japan. 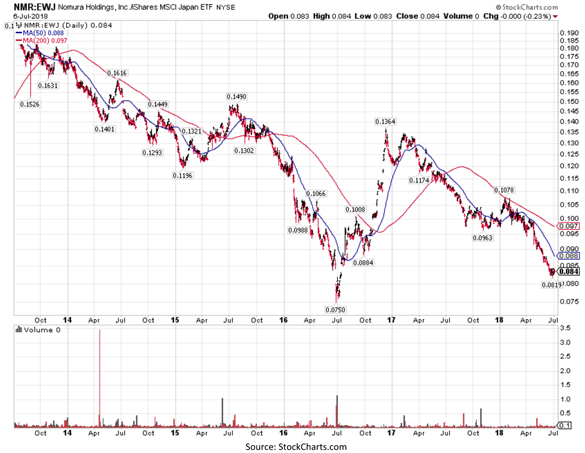 Comparing Nomura Holdings ADR (NYSE:NMR) relative to Japan iShares (NYSEARCA:EWJ) would ex-out the performance of the yen, which could be significant over the course of a year. Nomura Holdings had been weaker than the Japanese stock market in a similar pattern to Goldman Sachs relative to the US stock market. The only difference is that this had been happening for longer. Based on the action of Nomura and Goldman relative to their stock markets, which is similar to other securities firms in those markets, I do not believe that the period of uncertainty introduced by the Trump administration's tariff strategy is over. 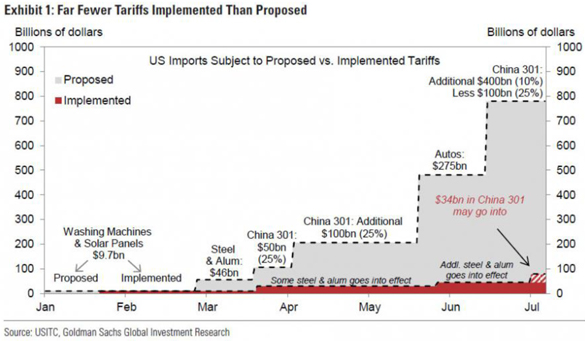 While the actually-implemented tariffs are a tiny smidgen compared to those that have been threatened, clearly investors fear that more tariff implementations are likely. I doubt that before this trade situation is resolved the market can sustainably rally. Disclosure: *Navellier may hold securities in one or more investment strategies offered to its clients. Disclaimer: Please click here for important disclosures located in the "About" section of the Navellier & Associates profile that accompany this article.